BRITISH COLUMBIA – The B.C. government has given the environmental okay to the Red Mountain underground gold-silver mine. The project, 15 km east of Stewart, is 100% owned by IDM Mining of Vancouver. The high grade underground mine will operate year-round with bulk mining methods. Ore will be trucked to a mill located in the adjacent Bitter Creek Valley where doré bars will be produced. The province added 38 conditions that are part of the Red Mountain permit. These include design requirements developed after consultation and input from Indigenous groups, government agencies, communities, and the public. 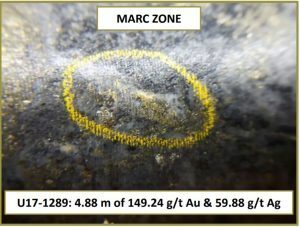 The property has 2.8 million measured and indicated tonnes grading 7.91 g/t gold and 22.75 g/t silver. The inferred resource is 316,000 tonnes grading 6.04 g/t gold and 7.60 g/t silver. The updated 2018 feasibility study proposed a 17% decrease in the cut-off grade to 2.5 g/t, but a 50% increase in the mining rate to 1,500 t/d. Capex is given as approximately $70.6 million. See the detailed Red Mountain presentation at www.IDMmining.com.